In the military the rank of a Field Marshal is the highest one and very few officers are appointed at this post. This post of a Field Marshal is known to be the five-star rank in today’s world in most of the countries.In most of the countries appointment of an officer to this rank means that that officer has made some great achievements for his country which cannot be matched. In the Indian Army the Field Marshal rank is the highest of all the other ranks and posts. It is a wartime rank and is given to a person who is extremely deserving of it. This is the reason that India has just has two Field Marshals till date. In India the Field Marshal ranks just above the General rank but it is not followed in the regular army structure. Only during the time of war this rank is made functional. Once the officer has been appointed as the Field Marshal, he will have to serve as the Field Officer until his death. The officer will be given the pay of a Four Star General and has to wear the uniform of a General in all the occasion that he attends. The Field Marshal is also in charge of managing and running an office in the Army Headquarter along with a secretariat. In India just two officers have been appointed to the post of Field Marshal until now. The first Field Marshal, appointed in the year 1973, was Sam Manekshaw. Thereafter in the year 1986 Kodandera M. Cariappa was appointed to this rank. 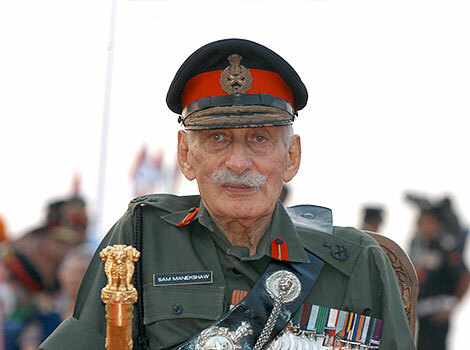 Sam Manekshaw the first field marshal of Indian Army appointed during 1973. He was the first Indian Army officer to have been given the five-star rank and called as the Field Marshal. With respect to his immense leadership during the Indo-pak war held on 1971, Sam Manekshaw was given promotion as Field Marshal. Later Prime Minister of India during 1971 Indira Gandhi promoted Sam Manekshaw to Field Marshal and also appointed him as the Chief of the Defense Staff. But due to some internal controversies the promotion to field marshal has been delayed and finally happened on 3rd December 1973. Though, the retirement of Manekshaw falls on June of 1972, he has been asked to extend his service for next 6 months by his higher officials. Later he was conferred with high rank Field Marshal during a ceremony held as Rashtrapati Bhavan. Manekshaw’s service is Indian army exists for about 4 decades, his service in Indian army started from British era. After his success in the war against Pakistan, he was promoted to be the first Field marshal of Independence India. Field Marshal Manekshaw joined the Indian Military Academy Army during its first intake in the year 1932. And ever since then he has been serving the Indian Army until he expired in the year 2008. During his service of four decades he has been a part of five wars. He fought as a part of the British Army in the World War-II. In the year 1969 he became the 8th Chief of Army Staff of the Indian Army. He fought in the Indo-Pak War in 1971 which further led to the Independence of Bangladesh from Pakistan. During his services he was the leader of many regiments and has been the commando of many assignments. He was also posted ti the 4th Battalion of the 54TH Sikhs. The article written by Manekshaw during his academy days titled “A Letter from Maneksam” grabbed lots of attentions of military officials. On June 1933 it was published in Academy’s Journal. Maneshaw was the fifth child for his parents Hormusji and Hilla. His father Maneshaw too served as a captain in British Indian Army. In the year 2008, at the age of 94, Field Marshal Sam Manekshaw died of some complication relating to pneumonia in Wellington. But he is still remembered and respected for the commendable service that he has done for India and taken the Indian Army to greater heights with his bravery and wartime intelligence. As an honor a granite statue of his was erected at Wellington, close to a bridge that is also named after him.